Not all people feel comfortable wearing colour anytime, for any occasion, or any season. It’s just not in their DNA. Then there are those that want to add color to a very BLACK wardrobe, but don't know which colours or where to begin, so they keep choosing black. This post is for those who wear mostly black, LOVE black, and don't ever want to stop wearing black, but once in a while, want to brighten things up. It will also be helpful for those that really DO want to start transitioning more colour into their closet. To start, here are a few reasons why purchasing black — especially for basics — is always a smart choice. *Easy to pack and coordinate with other black as well as coloured pieces while travelling. *Easy care, less washes, less time spent maintaining. Just be sure to keep the shedding towels and light fuzzy fabrics away from your blacks! *Hides perceived figure flaws, slimming. Here Colleen is wearing a floral chiffon blouse with coral earrings to match. Notice the blouse has a black background, keeping within the black palette she loves. Why is black your go-to color of choice? First and foremost, it's an easy choice for me. Wearing black starts my day in a calm, orderly manner, clear of distractions. Black and white stripes are always classic and always clean and crisp for summer. Colleen loves jackets, so when she gets hot, off they come. The key is to wear a black basic underneath that doesn't cling, like this tank from Sympli. Black shoes with white soles, like these from Fly London, are so fresh and trendy. So it's more about how you feel? Yes, it's definitely more about how I feel than how I think I look. I have a lot of things going on everyday, so this (black) is one less thing that I don't need to spend precious time on. Simple, easy, get dressed and go. Here Colleen is wearing another lightweight jacket, this time with a looser blouse-like feel. Tiny pinstripes add some interest, but let's face it, this is mostly black and that's okay. When wearing a black blouse, an easy and impactful way to add some 'summer' is with bold-coloured accessories. Oh, and paint your toes to match! For me personally, colour or print complicates my closet so I choose carefully. It's not like I don't have great pieces with color, 'cause I definitely do. The key for me is that the print coordinates well with black and it will often be a piece that I can take off if I'm not feeling it that day or am hot, like a jacket or wrap. I do have a few colourful tops as well, but I must really, really like it before I'll bring it into my closet. With this look, Colleen has added the Class Act vest from Sympli to tone down the vibrant yellow blouse. I only have one closet/wardrobe. I don't have spring/summer and fall/winter, so I have to keep my choices tight and functional. I donate pieces that I find I don't wear enough or might wear "someday". So, many of my black items can be worn all year. I just throw on different cardigans, vests, jackets, etc. to suit the season. Here Colleen is wearing a crop legging with a high slit black tunic over top. A beautiful sheer, colourful kimono from Free People softens the outfit. Perfect for a summer wedding or party. With so much color and print in The Sandbox, and your strong feeling about black, how do you serve people at the dressing rooms? It's easy. I love black, but I also love colour too, just not on me as much. Black is not everywhere in my life - my walls are covered with vibrant artwork collected over years of traveling. Seeing bold prints and colours in the clothing that we choose for The Sandbox is fun and exciting for me and for those who thrive on color. I enjoy dressing women in what "they" feel good in. 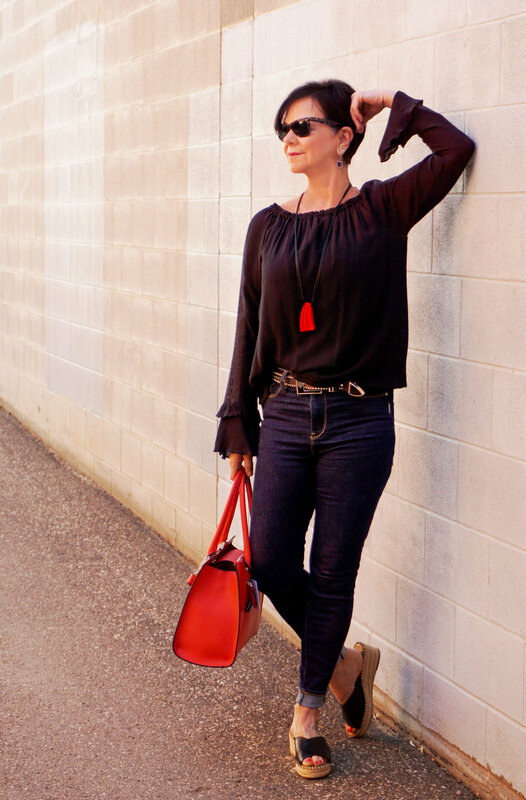 Women will often feel pressure by people in their lives to wear less black, however if you feel strongly about only wearing black, it is your choice to do just that, wear black! See you on Broadway and Main!